Ever wonder how Midnight Circus produces an amazing show every year? Like all great enterprises, it starts humbly in a garage. Or in this case, an intimate circus studio that was once a garage! 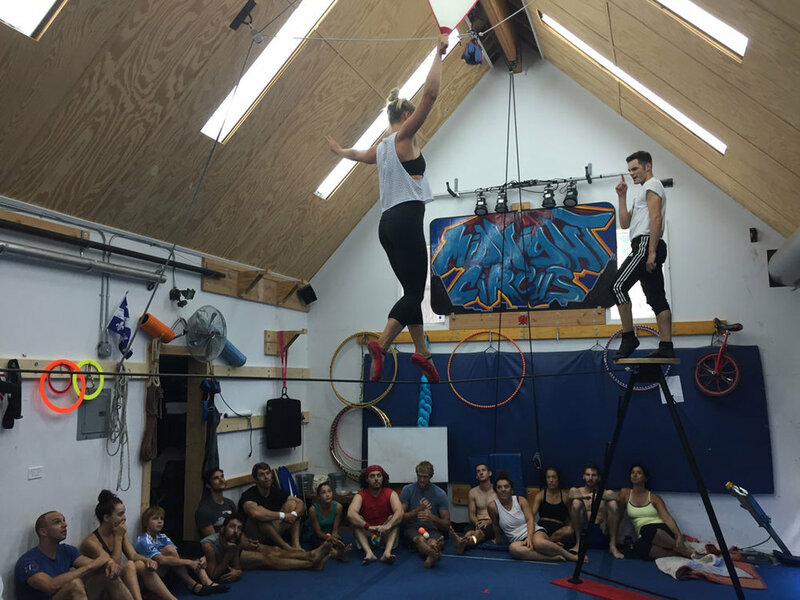 Acrobats come from all over the world to take over directors Jeff and Julie’s house and yard for the four-week rehearsal process. The creation of an entire circus show does not go unnoticed by neighbors – they look forward to watching people and props fly through the air every year. Creating an entire show out of a small studio is no easy feat (choreographing dance numbers and stacking people on top of each other can get a little crowded) but the small space prepares the cast for what is to come – performing under the Little Big Top. When performers come to work for Midnight they are being invited to be a part of the Jenkins family and the community of Chicago. The family grows bigger each year, and lasts long after Midnight’s 10-week run. Former cast members who pass through Chicago pop in to visit old friends, meet new members, and come to weekly family dinners hosted by Jeff and Julie. We are looking forward to beginning our rehearsal process this August, and sharing our 2019 Tour with all of Chicago! Watch our video to see how Midnight creates a new show every year!